Welcome to the Shine 9! For this installment of the Shine 9, we have chosen to feature Suzi Shelton, an award-winning songwriter and performer who has been making original music for families for more than a decade. Suzi has performed at such prestigious venues as The White House, Lincoln Center, and Symphony Space in NYC, and is a favorite among the hip tot set in her home turf of Park Slope, Brooklyn. She recently released her third album entitled “Smile In My Heart,” to much critical acclaim, and continues to write new material for her young audiences. In addition to her live performances, Suzi produces a monthly interactive online show that can be viewed from any computer giving children everywhere the chance to experience her signature sound. The proud mother of two children (ages 16 and 10), Suzi also works and performs regularly with students at area schools and is currently obtaining her certification from The New School in NYC for Creative Arts Therapies and Health. 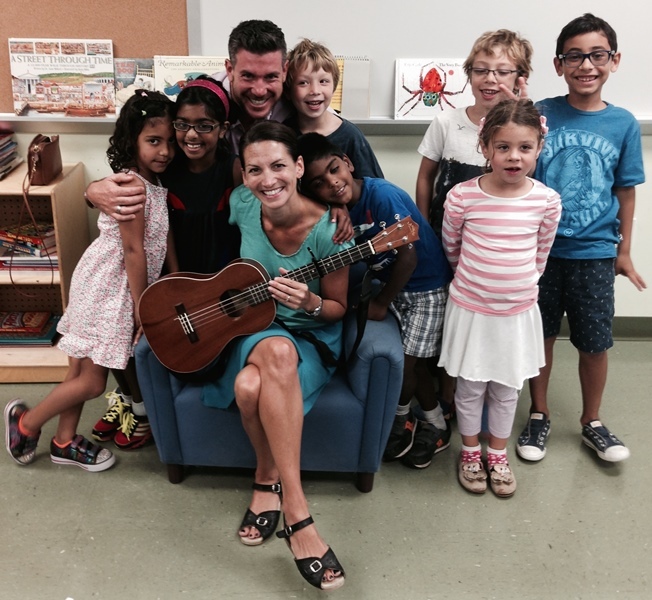 We at Shine love Suzi, especially when she shows up at our Hamptons camp for an impromptu performance! My Father’s Dragon – it’s a three book series about a little boy who goes on an amazing adventure to save a baby dragon. Both of my kids loved to cuddle up and hear this read to them when they were little (now they are 16 and 10). This series was read aloud to me when I was in first grade by my favorite teacher, Mrs. Wallace, and I always vowed to read it to my own kids – and I did. When I was a little girl, however, I also loved reading The Little House on the Prairie books by Laura Ingalls Wilder. I would imagine that I lived in a home without electricity or running water, and my sister and I would climb in our trees of our own backyard and pretend to be Laura or Mary. 2. What children’s movie or TV show is a guilty pleasure now? I love the “Despicable Me” movies – both one and two. They are so funny and well-written that I am always laughing out loud, and so are my kids. 3. What do you do creatively with your kids? My 10 year old daughter likes to be creative in the kitchen and bake cookies or cakes, so we try out different recipes together. I must admit, I am not that “strong” of a baker, so when something turns out well, we are really happy! Last week we made ginger molasses spice cookies that were delicious. They didn’t last very long around here. 4. How do you handle your kids’ use of media at home? We really try to limit media use to one hour a day, (which is harder for our 16 year old son – so if he has his homework completed, he usually gets a little bit more time). We also don’t allow our 10 year old to use her iPad during the week – weekends only. It has made a huge difference in her creative play time during the week. 5. What children’s TV show or character you wish would just quietly go away and never be seen or heard from again? Since my kids are a bit older, I have to say that I wish that most of the “teen” Disney shows would go away. The sarcasm and the disrespect towards others really isn’t necessary, but it seems to dominate these shows. 6. What is the funniest thing your kid has ever said? When my son was three years old, he wrote a song called “Pigs in the Poo.” Luckily, my husband thought to record him playing his little guitar and singing it, so at least once a year we revisit that video and have a good laugh. It was the cutest thing ever because he was very serious about it. 7. If you could become an expert at something, what would it be? Or what else did you think about becoming when you were a kid? Do you still dream of this? I would really like to become an expert on meditation. I feel that when you have a quieter mind, you can really accomplish your dreams. When I was a child, I dreamed of being on TV. I still dream of being a TV star for children and families, and I am still trying to accomplish that dream. 8. What was your favorite dessert as a child? Now? I loved white birthday cake from Hough Bakery (out of Cleveland, Ohio where I grew up) but sadly, they went out of business. Now, my absolute favorite dessert is a vanilla cupcake with vanilla icing from Magnolia Bakery. 9. What was your favorite trip you’ve ever taken with your family? Or just ever taken? My favorite and most memorable trip that I have taken with my family was 2 summers ago when we went to Utah, The Grand Canyon, and Yellowstone National Park. We rented a 25 foot RV for over two weeks, and saw the most amazing and beautiful sites. It really opened my eyes as to how gorgeous our county is, and I hope to be able to do more trips like that before my kids get too old. Those kinds of trips are truly inspiring, and you get to connect with nature and family in a way that doesn’t always happen in the day to day here in NYC. In fact, in Yellowstone, we actually saw a little bear cub (we later found out it was called a cinnamon bear) eating some berries down in the valley, and I ended up writing a song about it on my newest album. We then turned it into a music video, staring my daughter as the girl in the purple shirt, my son as one of the dancing trees, and my husband as “Cinnamon Bear” the puppet and set designer.